A popular story is the adoration of the Magi from the Gospel of St.. Matthew became an equally popular theme in medieval painting. On this subject, pictures are written by virtually all famous artists of the era. Only Rubens has about one dozen paintings on this subject. But the work of the master of the Flemish school illustrated here is richer in plot content and relatively close to the biblical legend. Of course, Rubens could not deviate from the traditions of the time and reality of his era. Here the whole situation is “modernized” under the era of the artist. Magi are dressed in court dresses, except with the exception of Balthazar, and a certain pomp is felt. It must be remembered that Rubens lived and worked in the era of the revival of the Roman Catholic Church (the Counter Reformation), and the latter’s influence was in everything. Artworks were supposed to demonstrate the influence of the church on social life. Very often in the pictures were depicted by their customers themselves. 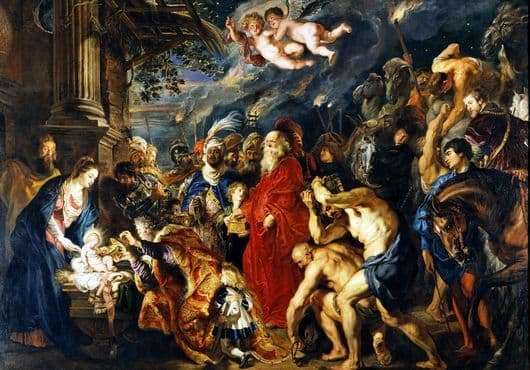 Joseph, with his penetrating gaze, patronizes the infant, the sorcerer Caspar on his knees presents golden gifts, Balthazar and Melchior in bliss expect their turn to present their gifts, which, according to the traditions of the Middle Ages, Rubens in golden containers made by masters of his era. All 3 wise men accompanied by children. To remind of the origin of the Magi, the artist in the picture depicted symbols of Oriental origin. These are the people accompanying the Magi in turbans and the camels of the Magi themselves. The gifts on Rubens’ canvas are more than the plot (gold, frankincense, myrrh). In the foreground, it is not excluded that by the order of the patrons, half-naked men are depicted with gifts, who seem to have suffered, and are not completely imbued with the significance of what is happening. And of course, the angels in the top view. Without them, they are here, albeit with a childish face, but with the wise eyes of the prophets. Rubens mastery, his ability to form a powerful composition, chiaroscuro forming volumes and an ingenious system of colors, are also characteristic of this picture. Here, nature feels alive – through the original plastic body. The picture is enriched with an abundance of figures, images (with pathetic gestures) and various accessories. The heroes of the canvas, as always, are emphasized corporeally. But the most important property of this picture is to create an atmosphere of faith in potential human happiness associated with the birth of the Christian era. The significance of the event, amazement and delight are reflected on the faces of almost all the characters. The above wonderfully complement the figures of animals.